I see PASC miners on nicehash but the NH miner not yet updated – how are they doing it? I am trying sgminer and loosing shares due to stratum disconnects/// frustrating! bat file for mining nicahash? Thanks Admin, tried the suprnova on both supernova pool and NH but still get share loss issue.. is this PASC algo sensitive to network latency somehow? Not be much different compared to other algorithms in that aspect, unless of course you have some serious delay, but that should be notable on other algorithms/coins/pools as well. Thanks for the feedback,, it is curious behavior which I do not see with other algos. Once NH miner is public I think this coin will go the way of ZEC.. it would be nice to catch some of the peak though! Like the coin has 6 months future. How’s the NVIDIA support for mining? 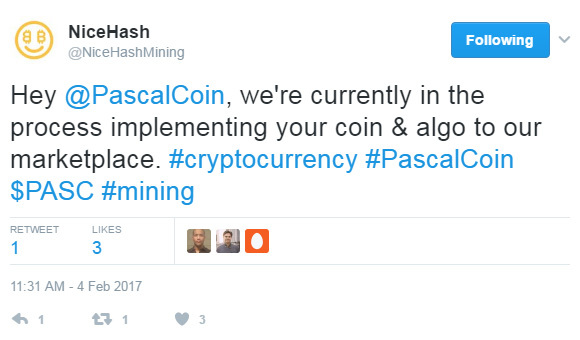 The sgminer also supports Nvidia for mining PascalCoin using OpenCL. Thank you for posting the CUDA miner.. it works! In version sgminer-5.5.0-pascal-1-windows-amd64 there is the problem of overusing CPU – i1840 doesn’t work with 6*gtx 1070! With iPentium G3250 I have 80% cpu usage. How can we solve this problem? This miner has strange “feature” – the more you decrease intensity, the more CPU usage increases.